Certain file formats on computers can be a pain in the neck. Some are immediately recognised and some aren't. The VLC media player is a free-to-use program - created by nonprofit organisation VideoLan - and is a helpful solution when applications or operating systems won't support a particular video file. With this in consideration, the president and lead developer of VideoLan Jean-Baptiste Kempf recently spoke with VentureBeat about the future of the media application. The overall aim is to offer more support and bring VLC to more platforms. According to VentureBeat, Kempf is even considering the media player for multiple console devices including the Nintendo Switch and PlayStation 4. VLC is already available on the Xbox One through the Microsoft Store. Video entertainment applications out now on the Nintendo Switch include the likes of YouTube, Hulu and NicoNico. There were also multiple rumours a while ago about the release of Netflix on the hybrid device, but there's still no sign of the service. 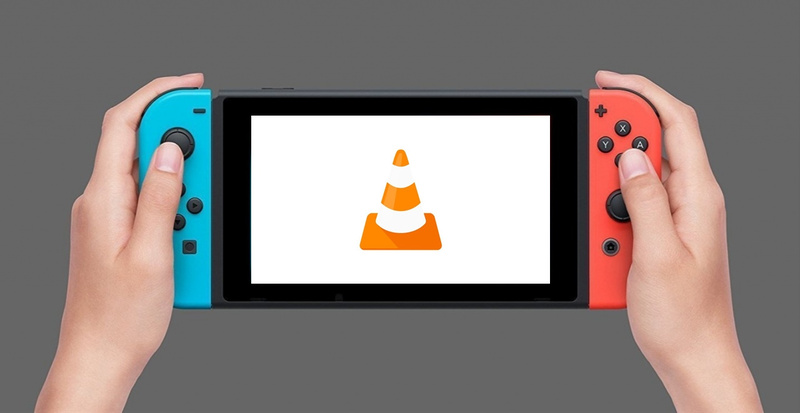 Would you like to see the VLC media player on the Switch eventually? Would you like more video playing applications and streaming services on Switch in general? Tell us below. Never heard of it. Will check it out on Switch if it's good. @TheAwesomeBowser You’ve never seen that cone icon on the Windows movie viewer? It’s part of my childhood. I’m only half kidding. @TheAwesomeBowser NEVER HEARD OF VLC!!? Where have you been man, it's the go to for playing media on PC. Supports basically every format. I'd personally enjoy being able to plug a USB into the switch and watch movies. VLC is awesome, and for me it’s a must-have on my computers. How would it work on Switch, though? Like if you put video files on a SD card it could read and play them? EDIT: Saw the user above me mention USB. That would be super convenient! I use VLC for all non-streaming content. It would be nice to have it on my Switch. Anybody remember the gba carts that had shows on them that ran at like 3 fps and looked terrible ? This reminds me of them for some reason. hey wait, this isn't Netflix. @CharlieSmile You’re right, it’s better than Netflix. So I gather such an app would stream vids from your PC right to the Switch correct? @CharlieSmile This would potentially be better than Netflix as you could load any video onto Switch and watch it wherever without internet (potentially depending on how it's implemented). @klingki I'm sorry, off-topic. But I gotta know, what game is that in your avatar? Interesting, but I have to wonder why I would even bother in this day and age. If this was 10 years ago I would probably have been so excited about being able to play downloaded videos on my Switch, but in 2019 I stream mostly everything so it doesn't really have a purpose on a device like the Switch. Either you downloaded VLC from a sketchy website, or Avast gave you a false-positive. There's already a video player for Switch... if you use CFW. VLC is nicer though. Switch is capable of playing 4K HDR (10 bit) 60fps h.265 (HEVC) video, PS4 Pro can't even play h.265 video. In general I don't really care about non-gaming apps for my gaming consoles (never downloaded the Youtube app for example) as I have several other devices for that sort of thing already. This could actually have a very practical use on the Switch though if you can put video files on your microSD card and play them on the go. Much more useful for the system than the streaming services that require an Internet connection. @Link-Hero It wasn't, and I got it from them, the thing installed a bunch of other stuff on my computer. Avast took care of it before anything actually happened, but yeah....it was from them. VLC is an excellent program, but I don't see what good it would be on the Switch. Unless people want to copy video files from their PCs to their Switch. On the other hand, I very much do like having more video app options on the device. I specifically want Crunchyroll, Netflix and Twitch.tv. I do understand why some people have no interest in those services, but I do and I am not alone in it. I have several people on my friends list who regularly use their Switch for YouTube. At least one of them already has pushed several hundred hours into it. I would rather use my phone for video and my Switch for voice chat. @Dahn_ It’s called Roof Rage. It’s like a pixel art Smash Bros. with a bit of Street Fighter thrown in that takes place across various Asian rooftops. It’s on Steam Early Access now, but it’s supposed to be coming to Switch eventually, which I’m super pumped for! VLC is a must have app for media playback. I found out about VLC when I came across the .ogm file format a few years ago. I've been using it over WMP ever since. @Heavyarms55 I love Crunchyroll, but I haven't gone to the Crunchyroll website since I got the VRV app that they made. I'd much rather have VRV on Switch since it has access to all of Crunchyroll's anime and live action stuff as well as other channels like Hidive, Shudder, and more. Ooooh, man, the nostalgia! I haven’t used VLC since I was in college- over 10 years ago. Didn’t know it was still around. My comment on the same level: Avast is a virus. @Koudai1979 If it works, I will take it. I play tv shows' episodes on VLC on my phone every week (one day, the others are filled with the Switch), and I wouldn't mind this possibility. But... doesn't it conflict with the "no piracy" policy? I mean, videos played on VLC are downloaded videos, right? I’d drop $20 on a VLC offering in a heart beat. ...They deserve it. They’re stuffs great and they’ve never been a pain in the schvantz. @Moroboshi876 It sounds like you’re assuming people are playing only pirated media. ...I think VLC would recommend only play ‘your’ media. (Ownership implied) and thus avoid that conversation all together. he maybe be considering the switch, but is nintendo considering his video player? there are two sides to this equation here. he doesnt just get to decide, no matter how awesome that would be. @Quincy So people are going to use VLC to play videos received via WhatsApp or recorded with their smartphone cameras, huh? @skywake That would be pretty sweet. Well I hope this works, because for some reason youtube wont work on my switch when its docked, it just glitches out with a sort of flashing static picture, I've tried to download it again but no joy, the funny thing is it works perfectly in portable mode. I dont want VLC on my switch,, im lukewarm to the possibility of netflix. VLC is old news now streaming services are affordable. My Nintendo Switch is a gaming console. Not a bloomin tablet! Those are what my kids toss about the living room and slowly destroy over a 1-18 month period, before they are replaced by the next $100 galactical tab-tastic banapple super computers. At least this is how my mid-thirties brain sees the tablet market. I don't think Nintendo are going to allow an open source media player on their heavily locked down device. It's a massive security risk and doesn't make them any money. They're a business, how do they monetise VLC? Id like this a lot. More apps and more versatile the better. No reason not to have similar apps for entertainment as the xbox and probably in the case of the switch they will be far more useful as they will remove the need to take a tablet and switch on travels. Damn, that would be nice. I've never heard of it before but I do recognise the cone icon so obviously I have used it before. Any free to use media formats are ok in my book. @Joeynator3000 when I used vlc player I didn't have a good time either, it wasn't a virus but it I had a lot of issues with the media player and I haven't used it on my pc or any of my devices since. @Retupmocnin are you sure about that? the switch dosnt display in 4k at all, maximun display in handheld mode is 720p and docked is 1080p. The only reason I could see Nintendo allowing VLC media player is to deter users from hacking the system to provide video playback functionality. And that's not a great reason if such an app potentially allows for unauthorised content or software vulnerabilities due to reading content off of the microSD card presumably. Nintendo already don't want to provide a web browser for the Switch for such reasons. If VLC did come to the Switch though, it sure would beat the games of converting videos to a weird format which are capped to 10 minutes playback length, and playing them through the Camera app on the 3DS. @huyi Nvidia Tegra X1 has hardware accelerated 4K decoder, even if the output is 1080p it can play 4K files easily. Oh my god yes please. I mean why not? Something had to be amiss because VLC is just straight software, nothing more. It's one of the most respected and beloved and trusted on PC. It's like WinRAR. Just one of those programs everyone has. I dont doubt what you're saying but... all I know is their software does not have viruses. A reupload could though. Especially one mimicking their site. Idk. What would be good is if they bought Plex over to Switch. VLC is awesome but I'm using mpv for my open-source media goodness. @Moroboshi876 Is say that’s possible. ...But primarily I’d think VLC would only discuss positive use. I don’t think they condone piracy on anything and therefore I wouldn’t see a reason for them to get blocked or punished for what the user-base might do. @Abes3 @GyroZeppeli Nope. Not even in the slightest. Please understand. @Quincy OK, I get what you meant. Thanks. Problem is I don't think that's the use most people would give to VLC on Switch, but on the other hand Nintendo wouldn't allow (I believe) the desired use, so... I don't see it being a great feature in this particular case. @JaxonH Except 7-zip is a million times better than WinRAR, but yeah, I've got VLC on my PC as well, no issues at all. @JaxonH WinRAR? You misspelled 7-zip. WinRAR has been like a joke for two decades, get on with the times. And also like others mentioned this is not happening just like a browser it would mean more headache in terms of potential vulnerabilities for the system, coupled with the fact VLC would need to read the files somewhere so, same comment. And streaming as input is not for the average joe doe who buys the switch. Definitely need it, it's what the switch is missing. Especially with the screen size of the Switch. It's perfect. Would love watching my favourite movies and misc videos on the switch. I'd need a huge SD Card for sure if this app releases. I prefer MPC-HC but I won't turn it down. @Angelic_Lapras_King Yes, if your media server is configured properly, (which is not difficult). I hope the XBMC Foundation gets a similar idea. I would be genuinely surprised if Nintendo approved it, though, what with the whole plug-in situation. Kool now I can upload my video to SD card and waste the space. Looks like we will need those 1tb microsd cards sooner then later. But if VLC comes I will download it. VLC is an ugly POS, but it's one of the few players these days that doesn't sneak adware onto your PC. @klingki Thank you very much. Now I know what to look forward to! Hey, dummy, the GBA video bombed, don't go back down that road!! @nintendosage Except you would be able to download any type of video with this. Plus, you don’t have to pay for each video. I fail to see your point. Yes please. It’s a great bit of software on Windows and Android. More options are good. I don't see a need for such a player. At first the Switch has to accept the files on your card before the player is allowed to read them. If the Switch blocks the files before the player is allowed to open them, the player is useless. I don't think Nintendo will allow unknown file formats to be read because of piracy cases. VLC would make a great addition. We could potentially watch Twitch-Streams with it but of course play pretty much everything from our very own music and video library as well. I guess some people might even try to stream and play non Nintendo games with it, which might become a thing if the Input-Lag isn't too bad. But well, back in 2017 people claimed there will be a Netflix App for Nintendo Switch soon. TL;DR: "Hot cooked, served cold" (if served at all).